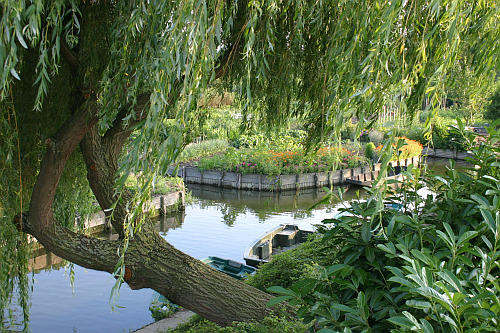 In Amiens, the Hortillonnages were made from former marshes into a huge garden extending over 300 hectares. The waters of the Somme and the Avre rivers supply a giant net of « rieux » (little channels) making this area very fertile to cultivate market garden produce sold,in turn,on the water market held in the city. During season visitors may stroll on special boats with a raised end (cornet).